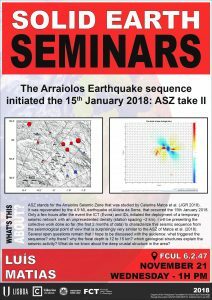 Next Wednesday (November 21st), Luís Matias from Instituto Dom Luiz, will approach “The Arraiolos Earthquake sequence initiated the 15th January 2018: ASZ take II” at 1p.m. (room 6.2.47 at FCUL – building C6). According to Luís Matias, the ASZ stands for the Arraiolos Seismic Zone that was studied by Catarina Matos et al. (JGR 2018). It was rejuvenated by the 4.9 ML earthquake at Aldeia da Serra, that occurred the 15th January 2018. Only a few hours after the event the ICT (Évora) and IDL initiated the deployment of a temporary seismic network with an unprecedented density (station spacing ~2 km). 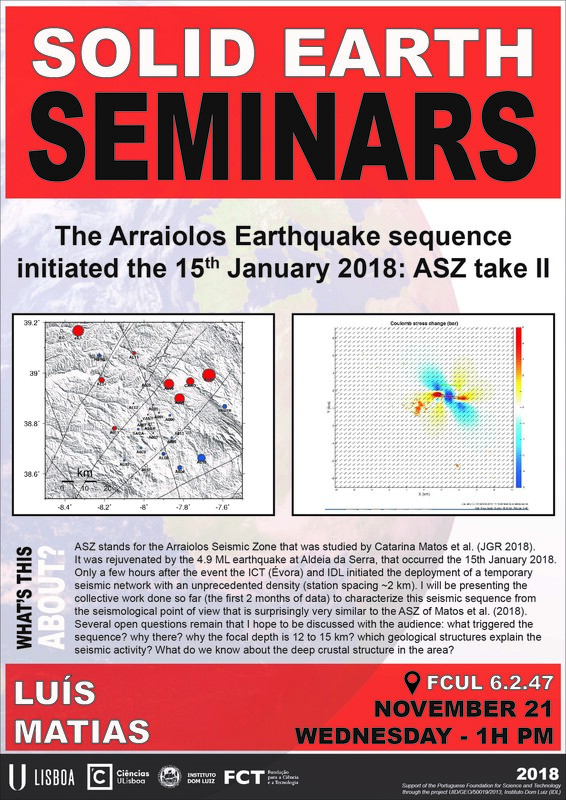 “I will be presenting the collective work done so far (the first 2 months of data) to characterize this seismic sequence from the seismological point of view that is surprisingly very similar to the ASZ of Matos et al. (2018)”, explains the researcher. He expects several open questions to discuss with the audience, such as: what triggered the sequence? why there? why the focal depth is 12 to 15 km? which geological structures explain the seismic activity? What do we know about the deep crustal structure in the area?